A valuable, quality lotion, designed to treat and offer a light natural protection to the skin in the sun and the solarium. The skin protecting Vitamin E and Beta-Carotin penetrates deep throughout the skins layers by means of highly active Multi Layer Liposomes. 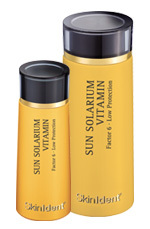 Important Note: SUN SOLARIUM VITAMINcontains no UV Filter therefore it is essential to apply a DR. BAUMANN sun protection product with a high SPF when exposed to the sun for a longer period of time.